Throughout our lives the stars rise and set in a seemingly unchanging pattern. Over the centuries humanity has named constellations and made them legends, and navigated seas by the eternal stars. We now know that stars are not fixed points of light, but rather move ever so slowly across the sky. While many early astronomers speculated that the stars might move over time, it wasn’t until 1718 that Edmund Halley confirmed the motion of a few stars. Halley was trying to determine the precession of the equinoxes, which is the overall shift of the Earth’s axis of rotation relative to the stars. At the time it was known that the celestial sphere shifted alignment over time, but the rate of that shift hadn’t been measured. To do this, Halley measured the latitudes and longitudes (we now use right ascension and declination) of about a thousand stars listed in Ptolemy’s Almagest star catalog. Halley compared his measurements with the results listed in the Almagest, as well as those listed in another star catalog by Hipparchus. Ptolemy’s catalog was published around 300 BC, and Hipparchus’ was published about 170 years later, so Halley could compare stellar motion over about 2,000 years. Halley found that overall the stars shifted in longitude by about 50 arcseconds per year, but he noticed that Aldebaran, Sirius and Arcturus shifted in latitude differently than other stars. Over 2,000 years they had shifted relative to other stars. This relative motion of stars across the sky is known as proper motion. It is this motion that causes the stars to move over thousands of years. The constellations we see today are only temporary. They were not the constellations of our long-ago ancestors, and they will not be the constellations of our far-future descendants. Since Halley’s first observations, astronomers have measured the proper motion of thousands of stars. But in the past couple decades that number as grown exponentially. In 2000, the Hipparcos catalog was released. Based on data gathered by the Hipparcos spacecraft, it contains the positions and proper motions of more than 100,000 stars. This year initial data from the Gaia spacecraft was released, containing the position and proper motion of more than 2 million stars. Since stars basically move freely through space, we can use their proper motions to predict where they will be in the future. You can see this in the video above, which plots the proper motions of Gaia’s 2 million stars. It gives us a glimpse of how future generations might see the night sky. Proper motion only tells us about part of a star’s motion. A star can also move toward us or away from us, following what is known as radial motion. The combination of radial motion and proper motion determines a star’s true motion relative to us. Fortunately the radial motion of a star can be measured by observing the spectrum of light it emits. 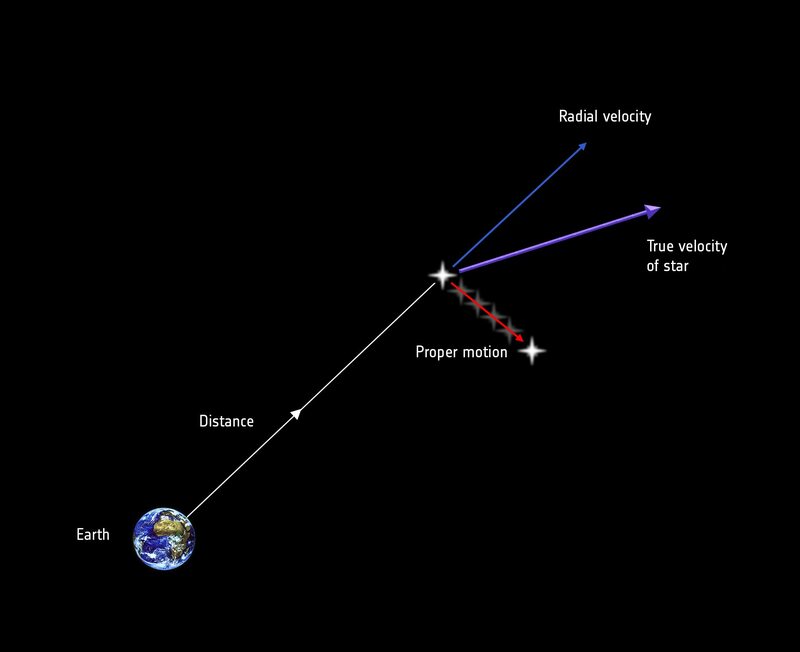 As a star moves toward or away from us, its spectral pattern is shifted by the Doppler effect, allowing us to determine its radial motion. The Gaia spacecraft is also making radial motion measurements, and that data will be released soon. In the past it was believed that the stars could determine the future of humanity. But through careful observations, humanity can now tell the future of the stars. Is it correct to say that all the stars that are located 5 million light years from earth are right now in the positions indicated at the end of the video? I would say no, to the above question, for the simple understanding that all heavenly bodies, are in continuous motion.